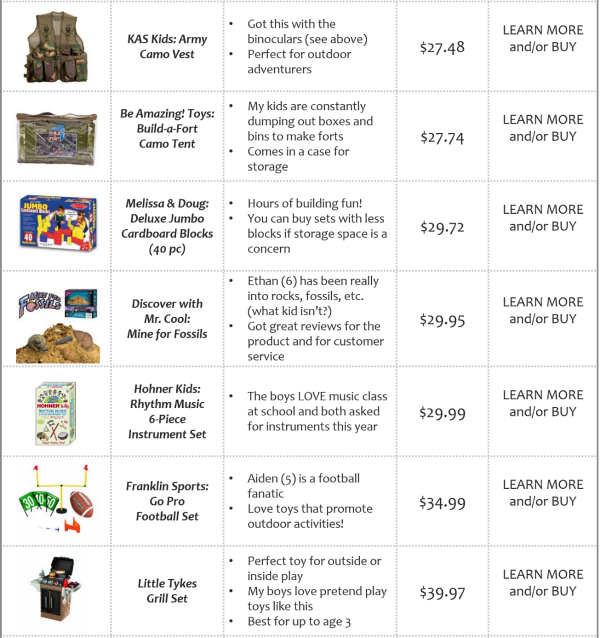 Here it is...a LONG list of gift ideas for boys of all ages! If you want to find the perfect present, look no further. I spent all afternoon compiling what I think are THE BEST toys for boys. 1. I am a researcher by nature so before making any purchases I always read customer reviews online. I don't purchase anything with less than a 4 out of 5 rating...so everything on this list has passed the same test. 2. 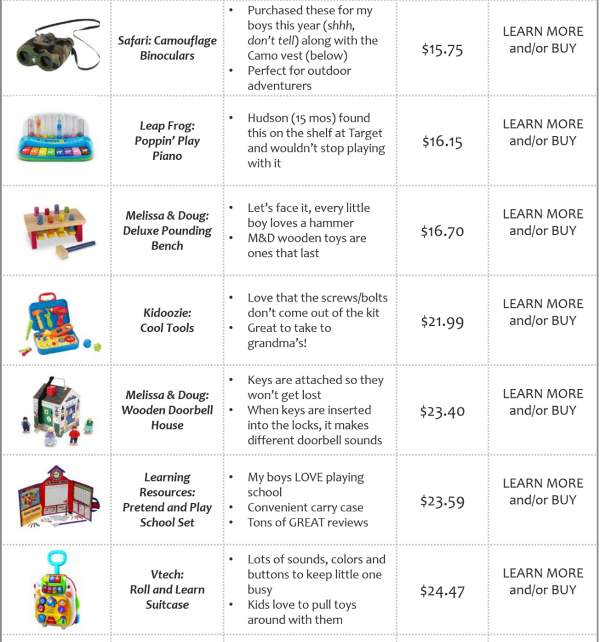 I didn't put an "age" category because my kids don't usually fall into the typical recommended age range of a toy. You know your child best and know what they would like/play with. Just be aware that some toys do come with small pieces so be sure to take that into consideration when purchasing gifts for kids smaller than 3. 3. 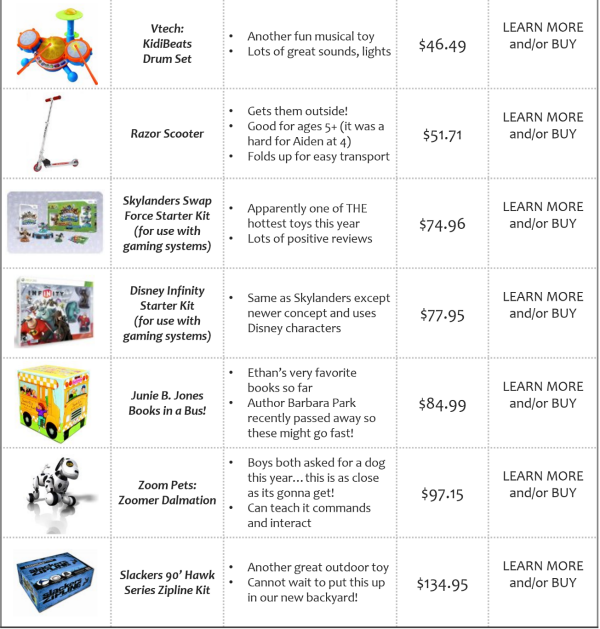 *The price column indicates the purchase price of the item on Amazon.com when this list was published. Some prices may differ when you are doing your shopping. 4. 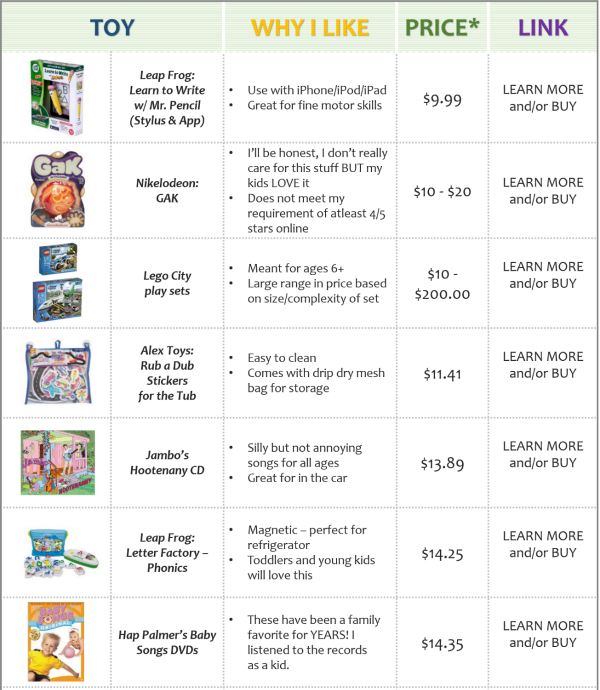 To read the customer reviews, learn more about a particular product, see the current price and/or purchase on Amazon.com, click the "LEARN MORE and/or BUY" text in the very last column. You can also click on the image of the toy in the first column as well. 5. I highly recommend you subscribe to Amazon Prime before doing your online holiday shopping. Most of the items on this list are "Prime Eligible" meaning you will receive FREE 2-DAY SHIPPING! Even on larger items! When you add up how much you will save, it will more than exceed the price of joining as a Prime member. ENJOY! 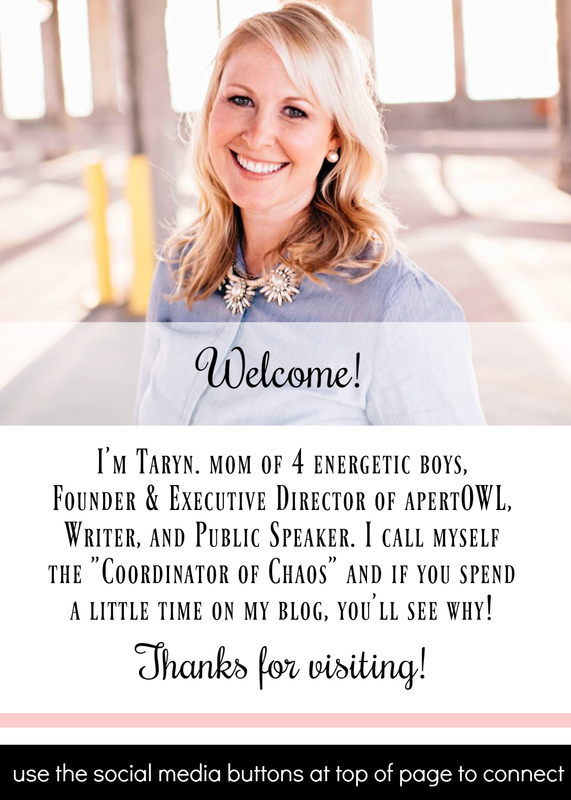 And if you find this list helpful, please SHARE it on Facebook or PIN to Pinterest. Thanks and happy shopping! DISCLOSURE: This post contains affiliate links. If you purchase any of these products using the links provided on this page, I will earn a percentage as an Amazon Associate at no additional cost to you. In no way did my affiliate relationship sway what items I chose for this list.